For the last 4-5 months TDI has been trying to get to the heavily contaminated village of Boholgaras, 40kms east of Dollow in South Central Somalia. 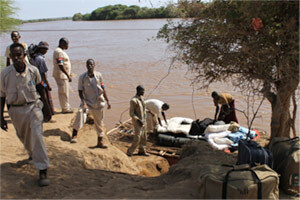 Operations have not been possible because the 160km drive through Luuq meant there was no viable CASEVAC plan. This route was also subject to ambushes laid by Al Shabaab insurgents. 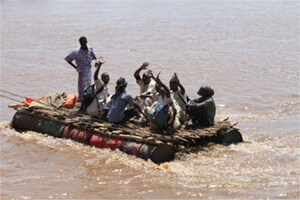 The Juba River runs between Dollow and Boholgaras but there is no bridge, therefore a raft was built which is now used to transport goods and personnel to Boholgaras. This has greatly reduced the time and distance it takes to get from Dollow to Boholgaras and TDI can now work in this remote area as the teams can now be casevaced out safely and efficiently if necessary.